This section displays some propaganda posters which expoited the execution of Nurse Edith Cavell by the Germans. Their purpose was to portray the Germans as vile barbarians and to justify the war against them as a clash of civilization versus barbarian hordes. A brutal German soldier executes a defenseless Nurse Cavell. 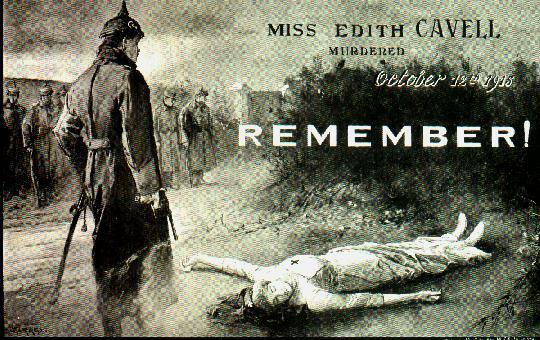 The caption reads: Miss Edith Cavell murdered October 15, 1915. 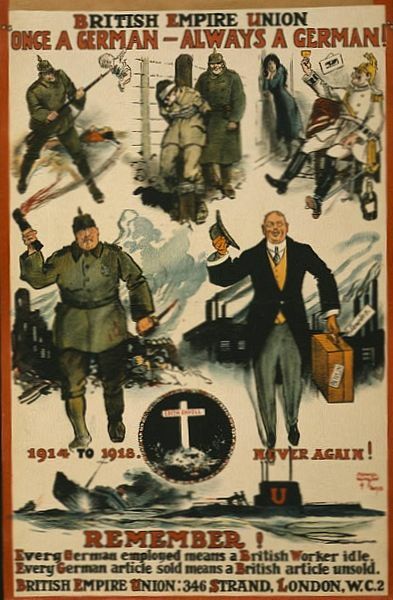 The goal of posters such as this was to portray the Germans as ruthless barbarians and instill a willingness to fight in the British population. "Once a German, always a German". British post war propaganda continued to make use of German atrocities including the death of Edith Cavell to sway public sentiment against the Germans. Even after the War, British sentiment was strongly against the Germans. This poster reminds its readers that "Once a German, always a German." It also depicts past German brutalities and has a vignette of Edith Cavell's grave and the caption, "1914 to 1918. Never again!"